Nancy and I did a post last month on Candy Corn Popcorn for Halloween. It was delicious and we loved the way it turned out. It was so good we decided try a different version for Fall/Thanksgiving. We went a different route and made a caramel popcorn this time. This Harvest Caramel Corn turned out great! I dare say it was even better than the Halloween popcorn. Harvest Caramel Corn is a great Fall treat or Thanksgiving dessert the features salty popcorn, creamy caramel and sweet chocolate. So very delicious and easy to make! Salt popcorn and set aside. Melt 1 cup of butter in a medium saucepan over medium heat. Add 1 cup of brown sugar and stir until thoroughly mixed. When it reaches a boil allow it to cook for 5 minutes without stirring. Add the 2 tsp. of vanilla at the 4 minute mark and stir to mix. Continue to boil for one addition minute and then add the 1/2 teaspoon of baking soda. Drizzle 3/4 of the caramel mixture over the popcorn. Use a spoon to gently fold the popcorn with the mixture until the kernels are all covered. Save 1/4 of the mixture to the side. Pour the popcorn out onto a cookie sheet covered with aluminum foil or a silpat liner. 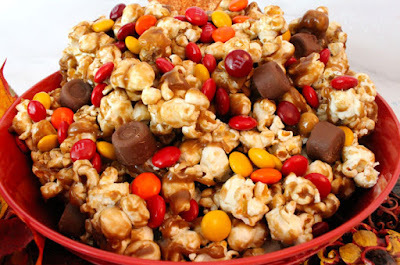 Drizzle the remaining caramel mixture over the caramel corn and immediately sprinkle the M&M Candy and the Mini Rollo’s on the areas with the drizzled caramel mixture. 0 Response to "HARVEST CARAMEL CORN"